The SUBWAY® brand is the largest submarine sandwich chain in the world. We’ve become the leading choice for people seeking quick, nutritious meals that the whole family can enjoy. Fred DeLuca founded the SUBWAY® Chain in Connecticut, USA, in 1965. The company has since grown into a multi-billion dollar business, with more than 41,465 outlets* in 104 countries**. The first SUBWAY® Restaurant in Australia opened in the city of Perth in June 1988. Australia is the SUBWAY® Brand's largest market outside North America, with more locations than any other chain. 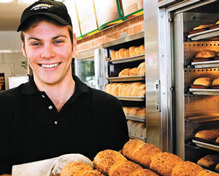 What makes a successful Subway® Franchise owner? *, ** Information correct as at September 2011. Numbers subject to change. Please visit our website for the latest restaurant and country counts. SUBWAY® is a Registered Trademark of Doctor’s Associates Inc.